Size: (image within the window mount) 37.2 x 24.5 cm; (frame) 64 x 49.9 cm. Condition: the sheet is in very good condition; the timber frame is unvarnished and has minor signs of its age (i.e. yellow oxidisation, insect specks and dustiness), there are light scratches on the Perspex/acrylic sheet and the backing sheet should be replaced. 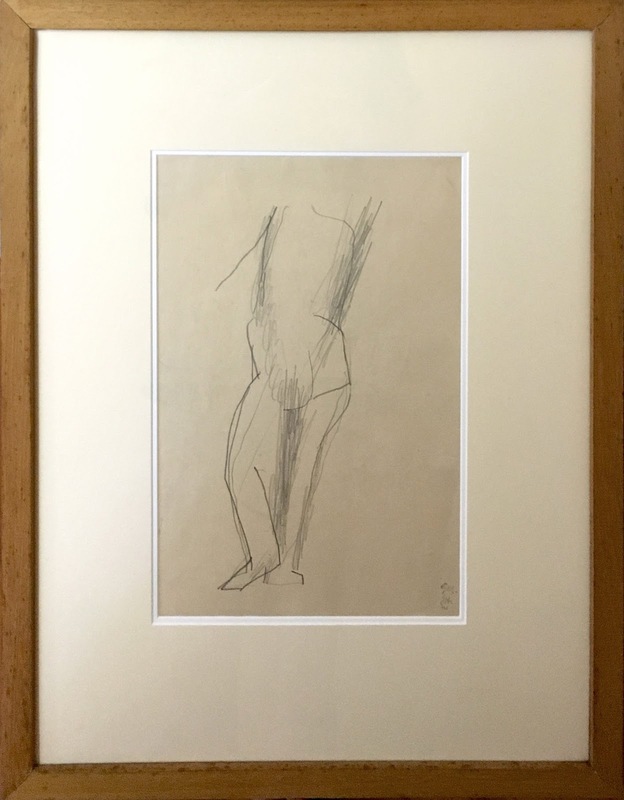 I am selling this framed, original, museum-quality life-class drawing by Godfrey Miller for AU$980 (currently US$709.26/EUR632.74/GBP491.70 at the time of posting this drawing) including postage and handling to anywhere in the world. 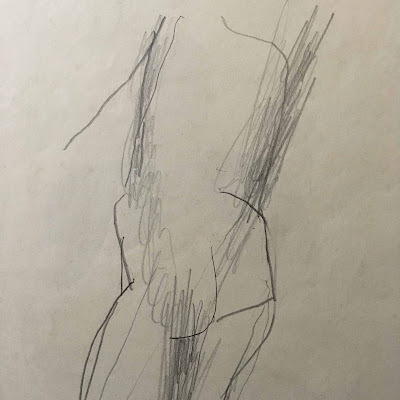 If you are interested in purchasing this analytically strong figure drawing by one of Australia’s most famous artists, please contact me (oz_jim@printsandprinciples.com) and I will send you a PayPal invoice to make the payment easy. Of all the Miller drawing that I’ve posted over the last few days, this is my favourite. What I like about it is the duality and contrast between single strong lines and lightly laid scribbled gestures where both sets of lines perform different functions. 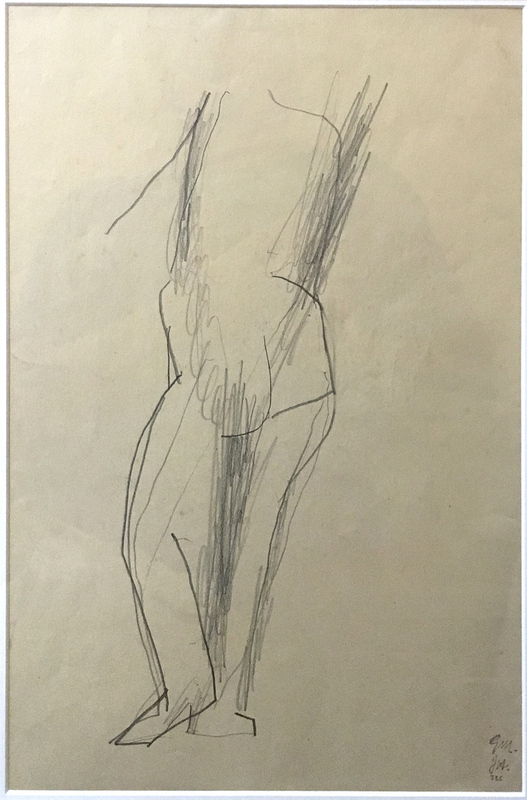 For me, the single strong lines represent Miller’s perception of critical silhouette edges observed in the model’s contrapposto pose. 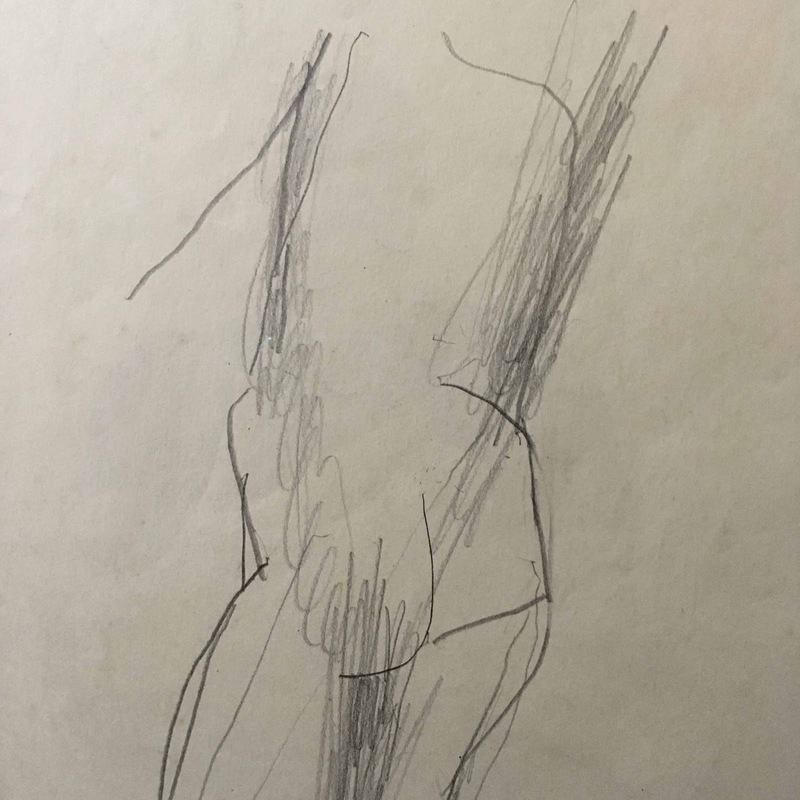 By contrast, the scribble gestures signify Miller’s perception of essential thrusts and shifts of movement as the model—most likely a female judging by the hips—balances her weight on one leg.